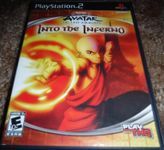 Avatar: The Last Airbender – Into the Inferno is an action adventure title for the Wii and Playstation 2. The game is based loosely on the third season of the television show Avatar: The Last Airbender. Into the Inferno follows Aang and his friends as they endeavour to thwart the Fire Lord from taking over the Earth Kingdom. Each stage features two characters from the show that can be controlled interchangeably or with a friend. Each character has unique combat capabilities based on their bending element or boomerang, and the Wii version of the game makes use of the motion controller to activate these abilites. There are a number of puzzles where players need to use their bending powers to activate levers and various other objects to continue. There are 11 stages to play, each based on events in the show, and players can revisit stages after they’ve completed them to search for hidden scrolls.